A program that can detect gunshots within 82 feet of where they were fired will likely be expanded in Denver. ShotSpotter sensors were installed at the start of the year, covering an unknown amount of square miles, to listen for gunfire. When the sensors detect gunfire, they send an alert to dispatch and to the computers in officers' vehicles. The alert comes with a map showing the location within 82 feet and an audio recording of the gunshots, all within 38 seconds. Denver Police want to triple the coverage next year. "We knew after five months that there was a significant value to the system," said Denver Police Capt. Steve Carter, the program's manager. "Seventy Four percent of the time, we would never have made it to that precise location if it had not been for that ShotSpotter alert. That's huge." The funding for the pilot program was paid for by the Bureau of Alcohol, Tobacco, Firearms and Explosives. The expansion of the coverage will cost $525,000, and will be paid for with two federal grants and Denver Police budget money, as long as city council approves on Monday. 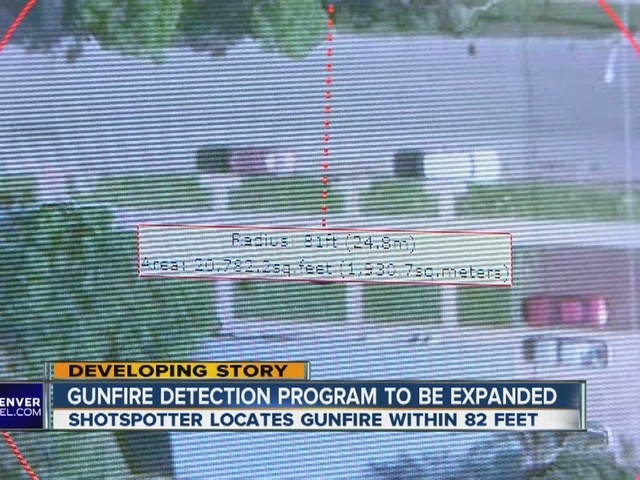 "ShotSpotter really does add value to trying to address gun violence," said Carter. "Precise locations of incidents, with timely notifications, leads us to people with guns." According to Denver Police, through September, ShotSpotter led to 26 arrests and 14 guns being recovered. One of the incidents happened in late April in north Denver, when two people were arrested after officers were alerted to four gunshots. According to the arrest warrant, officers responding to a ShotSpotter location found two men walking away from them between two houses. The police detained the two men. When they looked between the houses, they found one weapon and a right-handed black glove with blue trim. One of the suspects still had the left-handed black glove with blue trim. He was arrested and charged with prohibited use of a weapon and being a felon in possession of a gun. The other suspect had a magazine for a nine millimeter handgun, but did not have a weapon. A witness called 911 and reported that he heard gunshots and thought he saw someone hide a weapon in the neighborhood. Police found a nine millimeter handgun. This suspect was charged with prohibited use of a weapon and violation of a protection order. While ShotSpotter led police to the crime scene, it's likely they would not have found the evidence without the 911 caller. "At some point, I thought I saw the person ditch a weapon and so that's when I called the police," said the witness, who did not want to be identified. "They said it's common for suspects to ditch a weapon and then, either themselves or have someone else, come back and get it later, so the fact that I was able to see where that location was and it was recovered, they said was huge." Denver Police found that in the first six months of the ShotSpotter program, people called 911 only one out of every three times that ShotSpotter detected gunfire. "Are they desensitized to it and they don't call? Is it they don't call out of fear? Is it they don't call because that's the norm for that neighborhood? I don't know," said Carter. "What ShotSpotter doesn't tell us is; what'd the suspect look like? What was he wearing? What was he driving? Which way did he run? ShotSpotter doesn't tell us all those things, that's why people have to call us." Denver Police won't disclose the locations or number of sensors it currently has in place. "I don't want guys with guns going and shooting the sensors and tearing them down," said Carter. "Unless you knew what you were looking for, you could be looking right at it and think that could be any number of things. People probably see them all day long, every day, they just don't know what they're looking at."